Somewhere, there's a stack of embarrassing pictures of me as a kid, dressed in one of my dad's suit coats and standing behind a cardboard podium, wand in hand and preparing to unleash a new set of magic tricks from some big pre-fabricated set. I never got very far with the magician ambitions -- I blame it on never mastering the fake thumb prop -- but the interest I had as a kid still lingers somewhere. That means I'm fairly predisposed to enjoying Make Believe, a new documentary executive produced by the directors of The King of Kong: A Fistful of Quarters and directed by J. Clay Tweel, who also worked on the film. Like The King of Kong and other recent documentaries Spellbound and Wordplay, Make Believe looks to fascinate viewers with a subculture they likely never really cared about. Although it lacks the flair of those other films and perhaps pushes the inspirational angle too hard, Make Believe is reasonably successful at achieving this goal. It helps immensely that the six teenagers at the heart of the film -- all vying for the title of Teen World Champion at the World Magic Seminar in Las Vegas -- all seem like real people pursuing a passion. Derek McKee is a 14-year-old from Littleton, Colo., who has overcome some of his shyness through magic. Nkumbuzo Nkonyana and Siphiwe Fangase are ebullient 18-year-olds from South Africa who put a lot less pressure on themselves than the others. Bill Koch is a 19-year-old from Chicago, gregarious but also obnoxiously confident in his own skills. Krystyn Lambert is a 17-year-old from Malibu who looks like she should be in the popular cliques, and is quietly championed as the next potential big thing in magic by a number of sources. Hiroki Hara is an 18-year-old from Kitayama, Japan, who forewent college in favor of honing his magic skills. Tweel follows each one's preparation for the World Magic Seminar competition and the new tricks that they're developing for it. Much of this section feels haphazardly edited, without a real sense of structure to determine the flow of events. Juggling six main characters is a challenge, and the film can't seem to settle for letting some fade to the background more. The film picks up a little more natural momentum at the competition, where the inherent drama kicks in. Here, there's little to distinguish Make Believe from numerous other films -- nonfiction or otherwise -- that climax with a competitive event, but we do care enough about the contestants that it's not hard to stay invested. Ultimately, Make Believe doesn't stray much from the "unusual competition documentary" mold that's come before it, and that's OK, provided you're interested enough in magic. 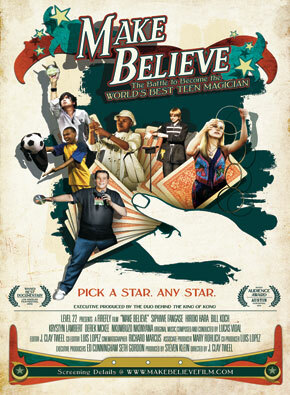 Make Believe is currently showing at select theaters around the country and is available for purchase on DVD at the official website.